The Birley is an artist-led studio group based in Preston, Lancashire. After working together on numerous pop-up projects and our MA shows, a group of contemporary artists formed the Post Post CIC in order to take on a longer-term space. With support from UCLan and Preston City Council, we started renting a former council office in Preston city centre, in the heart of the outdoor markets and adjacent to the Harris Museum and town square, from September 2014. As well as providing space for eleven artist studios, we have project spaces, workshops, residencies and events. The project is the first of its kind for us, the council and the Uni, so the first year has very much been a learning curve. Happily we’ve hosted many successful events and exhibitions, and are over-subscribed for studio spaces. In 2016 we’re looking at different ways to develop and expand our project. 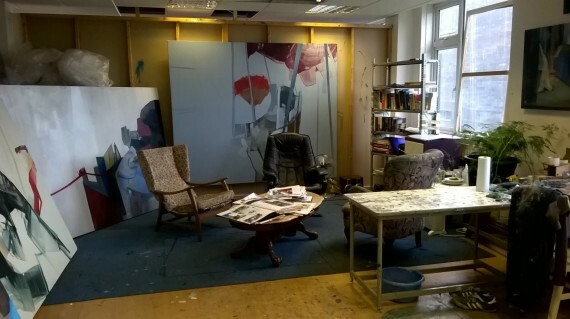 Since launching our long-term studio base in Preston city centre in 2014, The Birley Artist Studios has enjoyed a steady growth of interest and activity – enough so that we plan to expand both our programme and premises later in the year. But our project has been very much a pilot run – both for us and our landlord (the local city Council) neither whom have facilitated this type of project beyond the few month ‘pop-up’ model before. Hearing about a thriving culture of artist-led activity in the North East of England we decided to use the A-N Go and See bursary scheme to cross the Lancashire/Yorkshire divide, and investigate a number of different models, approaches and programmes of studio-led activity. Sustainable spaces / uncertain futures. The Newbridge Project was one of the main draws in choosing the North East as our research destination – and certainly the place we learnt the most from. Situated in a 29,000 sqft former office block in Newcastle city centre, the project (also ran as a CIC – but considering charity status) hosts 80 studios alongside multiple project spaces and a bookshop. The project roots are a familiar story – local graduates seeking an affordable space to keep a creative momentum going. Starting in 2010, a large government initiative for creative use of empty spaces came at the perfect time – granting a few £k to set up an what was initially a temporary project. Like many growing cities, wealthy private landlord dominate the geography, buying up sites and leaving them vacant until ‘the time is right’ for profitable development. For owners like these, the prospect of artist groups – like Newbridge – using the building at minimal cost in the mean-time can be an appealing – potentially saving thousands on normal business rates, as well as having someone keeping the building warm, dry and safe. Unfortunately for occupants, potential eviction can come at short notice as soon as a ‘better’ offer comes along (well evident in gentrified areas of London, but taking a little longer to happen ‘oop North…) – and this issue cropped up at nearly every venue we visited. Charlotte Gregory, Director at Newbridge, told us that the possibility of being evicted at short notice is always a concern – but that it certainly doesn’t stop them ambitiously planning ahead. Arts Council funding currently supports an 18 month programme of exhibitions and residencies, as well as a development role to assess the best structural and financial options going forward in their sixth year. East Street Arts – mainly based in Leeds but with hubs and projects across the North East and beyond – are evidence that this type of ambition and perseverance can pay off. (As well as a willingness to adapt – based at ‘East Street’ from 1993 to 2000 before moving to other sites, the permanent moniker lives on beyond the ‘temporary’ address). Now in their 23rd year as an organisation, ESA have managed a galactic array of projects between one month to several years long – from small commercial empty shops to disused town halls and warehouses. In fact, it was difficult to find a project in Yorkshire that’s not connected to ESA in some way – from supported spaces such as Navigator North (Middlesborough) and Salt & Powell(York) to associated projects by ESA members like Assembly Houses and the Live Art Bistro project (Leeds). Project Manager Adam told us that keeping a flexible outlook for each project was important, as well as matching the right people and practices with places. Their more secure base at Patrick Studios houses more established artists alongside their staff office, whilst temporarily empty spaces are perfect for local college students testing out ideas. Adam stressed the importance of getting a mortgage on buildings, where possible, to counter the anxiety of renting. With a long history, great reputation, and now National Portfolio Organisations status, ESA have the ability and ‘leverage’ to be able to do this – but it is unlikely to be an option for younger projects. As well as learning about these flourishing projects, we also, unfortunately, witnessed the other side of the story. Calling ahead to visit Stonebow project in York, we heard that their project had to start winding up at short notice, (after only launching in late 2015). Despite uncertain futures, Newbridge have grown ‘organically’ from ten, to twenty, to 80(!) studio members – taking on two floors of the large building first and then filling the rest. Studio holders pay basic monthly fees, which cover building costs, staffing and some programming – with project funding supporting the remainder. Having a good and flexible relationship with the private landlord from day one has helped the project to develop at the right pace. 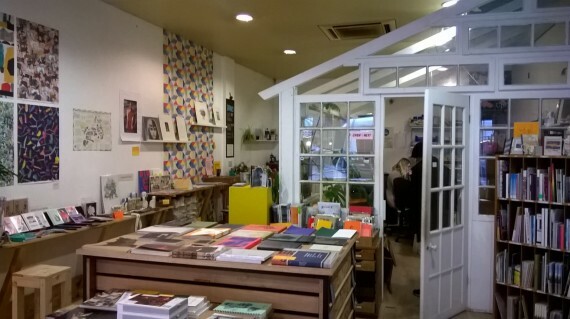 A bookshop also opened in 2013 – both as a commercial opportunity but more importantly as a space for relaxed social gatherings. On street level and next to a bustling bus stop, the space helps attract a wider audience – with talks, get-togethers, small exhibitions, poetry readings & more. Where Newbridge grew upwards, ESA grew out and across the region. As well as numerous supported studio spaces, new projects include ‘Live/Work’ residential house projects and the Art Hostel (opening any day now) – the first hostel of its kind in Leeds city centre. Particularly considering the now very vast size and scale that ESA now work at, these projects, importantly, will consider what it means to be a good ‘host’ in a city, for example when inviting other artists to visit and collaborate – extending the whole experience beyond the studio & gallery spaces – and into sleeping, eating, resting, working spaces. Taking stock and scaling back can also be a wise move, however. Bar Lane Studios (York) found that funding for studio or ‘short-term’ project seemed to dry up after two or three years, and some project members/leaders had also naturally moved on to other locations and ventures. Dividing the property up meant an independent coffee shop could rent the higher cost, main-street facing part of the premises, allowing for smaller but drastically more affordable studios area in the rear of the building. 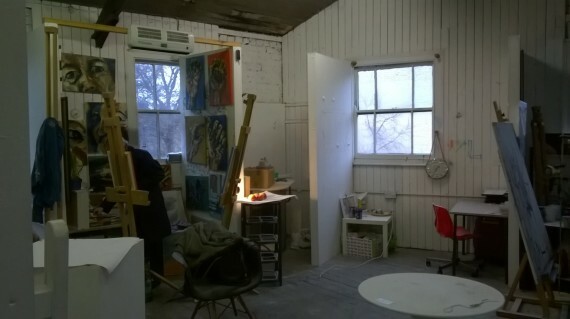 Artists Nathan and Chalky told us that other than occasional print workshops, and popular annual opens studios events, the space largely prioritizes individual studio practice rather than a regular public facing programme (although visitors are always welcome). Without the need (/distraction?) for strategy meetings, funding applications and invigilating events etc, artists there are freed to place all of their energy in their practice. It’s a refreshing reminder that artists practice is at the core of it all (especially when we have been occasionally been buried alive in paperwork/plans/forms at our project!). Every space we visited took a fairly unique approach to managing spaces and members – again Newbridge offered the most appealing model to us. To navigate their enormous studio membership, Newbridge annually invite studio holders to join a committee (usually ten or less) who help shape activities, alongside around three paid staff. Two project spaces are bookable by members (free) or non-members (students, graduates, public etc – a small fee payable) which allows for a degree of autonomous action & experimentation, alongside programmed events. That said, as our own project is an artist-led but with good links to both local authority and University, we understand the benefits in terms of funding, capacity and professional opportunity that are attached to institutions. At Baltic 39, with front-of-house, reception, technical work, marketing, funding, strategy, management and everything else covered, resident artists are somewhat freed to focus on their practice. 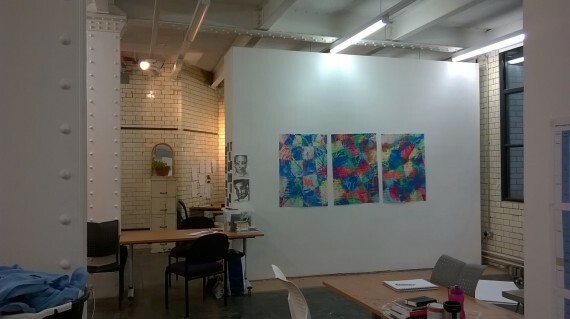 Large, neat and bright city centre studios are occupied on one floor by private lets to established artists and creative businesses, as well as, enviably, Northumbria University’s MFA and PhD students on the ground floor. Adjacent, large and well equipped spaces host two fellowship artists, who receive funds, space, exhibition opportunities and professional support. 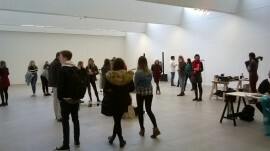 On the top floor, project spaces host a regular programme of exhibitions. On our visit the FIGURE programme is in full swing – an open call opportunity to utilize the space for any new work for a week – with financial, technical and professional support. Installations are still being tweaked as we are there: Peter (duty manager) and Hannah (Adult public programme assistant) explain that the short-run duration usually means that projects are approached as live and evolving works in progress: treated as a half way point between studio and gallery. The behind-the-scenes messiness and space to experiment is a great counter-balance to the otherwise very structured setting. Guiding us around the whole building, Hannah explained that witnessing the ‘flow’ of practice from student to post-grad, graduate, fellowship, emerging and on to early career/established artist is a highlight of the baby Baltic. It certainly seems like a welcoming path to try, to avoid that lurch into the unknown after graduation. Both Newbridge and ESA projects set out clear mission statements, which help them choose artists who will positively contribute to, and benefit from, prospective membership/involvement. With healthy waiting lists in place, this comfortably allows the ethos/vision to develop in the intended way. However when there are bills to pay and waiting lists are a little quieter, some studio groups have to consider broadening their member base in order to sustain – and whilst it’s useful to learn from other types of practice, it can dilute the intended project aims and identity. It’s a difficult balance to maintain. Baltic 39 manage the studios via the Council and University, having studio ‘holders’ rather than ‘members’. To help counter this a little, cross group-crits take place between students, artists, as well as staff and invigilators who maintain arts practices. Both Newbridge and ESA are in a position to offer development support to emerging and early career artists. A brand new membership scheme coming soon at Newbridge will offer workshops on how to manage being self-employed, for example, as well as skill-sharing and peer support. ESA’s membership scheme is long-running, offering portfolio advice and research trips. Every location placed importance on some kind of communal space – whether a small kitchen, foyer, break room, or simply a scramble of mis-matching chairs in the studio corner – as the main place where the best ideas develop, and connections happen. When buildings are often rented by the square foot, setting aside any space without direct rent/income can feel difficult to justify – but the outcome can be fruitful in many ways. Basically, both Lancashire and Yorkshire agree that it can all be sorted out over a good cup of tea. Our trip was a bit of a whirlwind tour, and we’re very grateful to all who welcomed us to their spaces and shared knowledge. The notes collected here are just a highlight of what we saw and learned – much is still being digested and shared – and hopefully just the beginning of new connections and conversations. 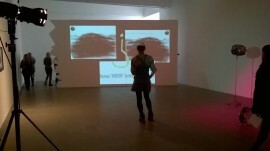 We’d also recommend the artist-led &Model space in Leeds, as well as online resources at Baltic Plus. “seeing other artist’s studios confirms my path – I’m doing my right thing, they feel like ‘home’.” (Martin Hamblen, Birley studio member). Artist and curator currently based in Preston, UK. Co-founder and co-director of the Birley Artist Studios & Project Space. Assistant Curator at the University of Salford Art Collection.